Hilaire-Germaine-Edgar Degas. Little Dancer Aged Fourteen, modeled 1879–81, cast 1919–21. 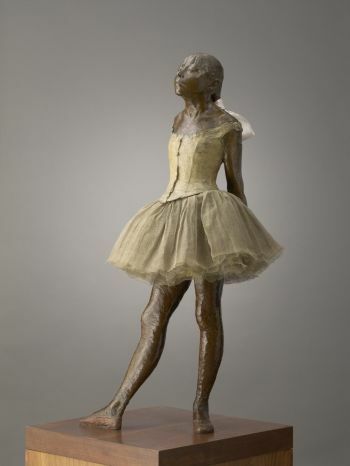 Bronze with gauze tutu and silk ribbon, on wooden base. Sterling and Francine Clark Art Institute, Williamstown, MA. Bassett, Jane, and Peggy Fogelman. Looking at European Sculpture: A Guide to Technical Terms. Los Angeles: J. Paul Getty Museum in collaboration with the Victoria and Albert Museum, 1997. Provides explanations and illustrations for terms used in describing and discussing European sculpture, mainly sculpture from the Renaissance through the 19th century. Terms include materials, processes, tools, techniques, media, and sculptural forms. Berman, Harold. Bronzes: Sculptors and Founders, 1800–1930. Chicago: Abage Publishers, 1974. “Especially valuable to collectors and investors who have searched in vain for published materials dealing with available bronzes of this 1800 to 1930 period.” Each illustration is linked to an entry that gives sculptor, date (when known), size, country where cast, description, founder’s mark, and, in some cases, the artist’s signature. Includes sections on criteria for evaluation of bronzes, identifying characteristics of bronzes, characteristics and identification of patinas, and care and cleaning of bronzes. Use the separately published index to find articles in all four volumes. Boström, Antonia, editor. The Encyclopedia of Sculpture. New York: Fitzroy Dearborn, 2004. Considers sculpture “in its broadest chronological, historical, technical, and international contexts.” Entries explore sculpture from the viewpoint of history, criticism, theory, production, training, and conservation. Also includes extensive country surveys, biographies, critical analyses of individual works of art, styles, periods, and materials, forms, and techniques. Most entries include bibliographies. Hauser, Christian. Art Foundry. New York: Van Nostrand Reinhold, 1972. Describes and illustrates the processes of metal casting, in particular the casting of art objects using the lost wax process and sand casting. Short chapters on artists’ foundries, casting variations (industrial and chilled casting), and a brief historical overview of casting from antiquity to modern times.